“I will answer, Mama!” Marie Brinker opened the door of their cabin one spring Saturday morning. “Hello, Gretel!” Marie said to the girl who stood there. Gretel bobbed in a little curtsy. Her brown braids circled her head and a big blue and gray-striped apron wrapped around her middle. “Mrs. Beger will butcher geese next week. She has sent me to ask you to a feather bee,” the girl said. “Can we go, Mama?” Marie thought the idea of playing with soft feathers very nice. “Will you be there, too?” she asked. 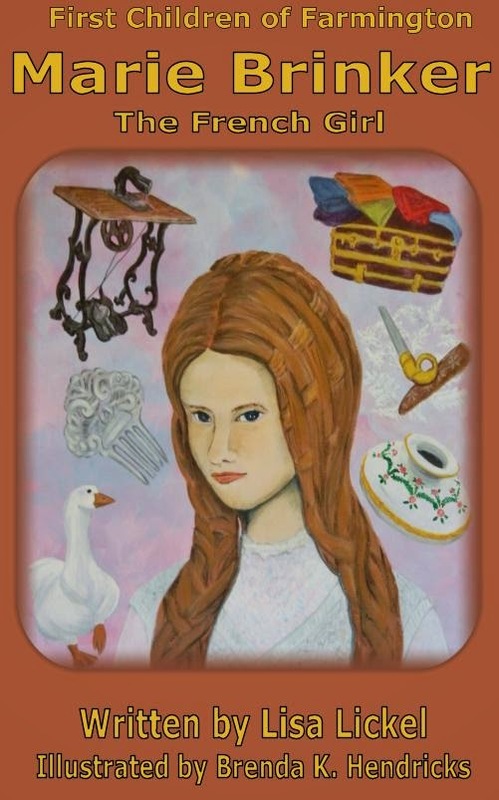 Gretel was Mrs. Beger’s “girl.” Even though she was only eleven, a year older than Marie, Mrs. Beger had taken Gretel in to help with her huge brood of children. Marie would love to have someone like Gretel to watch over her sister Matilda and brother Henri while Mama cared for baby Carrie. “Feathering is such a mess, my daughter. I don’t have anyone to watch the baby,” Mrs. Brinker said. “Let’s go, Mama. It will be fun,” Marie begged. Gretel made her curtsy again, smiled at Marie, and skipped away. “Can I turn the sign to ‘open’?” Marie asked.